This part of my trip really is a testament to how difficult traveling is. It is unbelievable that I am able to devote a blog post to the adventure of returning home, but the truth is "I could write a book" (- Pal Joey) about the challenges that I experience in pursuit of returning to Fairbanks. Bidding the "city of lights" Adieu, view from the Eiffel Tower. "It first started in Grenoble. Fortunately the night before I left I had a "packing extravaganza," I use the term extravaganza any time I try to get students excited about doing any mundane event. In class I find that it is very effective to say "Let's have a clean-up extravaganza, which sounds so much more exciting than "Let's work together to clean up the room!" Anyways I opted to have a packing extravaganza while the rest of my group went to the "London Pub," a popular hangout in Grenoble where they exclusively spoke English. Personally I was still a fan of a place called "Shakesbeer," but with my lack of directional ability, I was never able to find that place again after my first and only visit. So to get back to my stressful journey. I must admit that it started in a calm fashion. 0ne of my friends from the residence hall helped me to the train station. Unfortunately I had a plethora of things that I decided that I had to bring back from France. All I can say is that I hope my future students appreciate how complete my French library is because as you will find out from this account that every extra pound was a hassle in terms of bringing my stuff home. So off to start my exciting journey with 2 exceptionally heavy suitcases, two posters, a backpack, and a heavy hand bag. It was no joke to say that I was loaded down. When my friend went to put me on my first train it was ridiculous to see that my luggage took up an entire large section of the rack, oh well. About an hour of the Grenoble train comfort the true fun really begun. 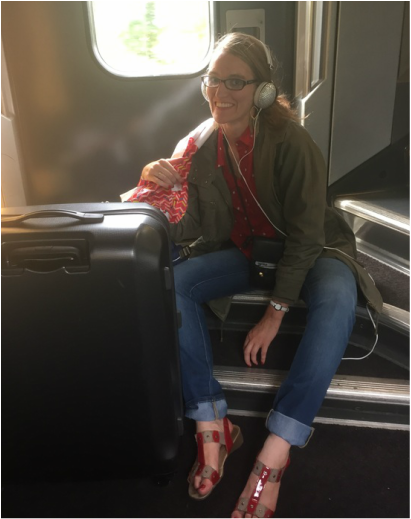 Hearing on the loud speaker that destination Paris (which I just assumed was me) had to get our connecting train on Track H. So off I leisurely unloaded all of my stuff toute seule (all alone) off of the train, then I started my questioning routine, which was ridiculous. I remember hearing a lot of people being like "Je ne sais pas"(I don't know) which was not especially helpful but at least was courteous, then finally a lady explained to me that I had to catch an elevator, walk through the train station, then take another elevator up track G and H, and added that I better hurry because I only had like 5 minutes. I can still remember her helping me into the elevator and then trying to push the button frantically in order to go down. It wouldn't work, then I remember a small child saying "Essaye l'autre côté" (Try the other side). I was extremely thankful. If only I could go back and explain how wonderful and helpful everyone was and even a small child was kind enough to want to help a frantic American. So with my ridiculous load I managed to go through the train station without the knowledge of its layout. Well the whole process took like 6 minutes and as I came out I can still remember the conductor being like "Depêchez-vous." This was a frantic "Home Alone" moment where I can just remember the conductor and breakman throwing my luggage on board and then proceeding to take off. After I got on they looked at my ticket and to their and my dismay I was on the wrong train. Because of this I ended up having nowhere to sit and therefore was confined to the stairs in the entry-way for 3 and 1/2 hours. They were like you could change trains and get a seat in like 2 hours and I was just like, "I can't and that I was just so tired and couldn't handle being lost one more time." They were sympathetic and seemed to understand. Then they got on their smart-phones and tried to find a method of arriving at Charles de Gaule airport (My final destination where I needed to go). I explained to them that there was no way that I could go down any stairs with my ridiculously heavy bags and that I would probably just end up taking a cab. Our train ended up coming into the station before I had recovered from my last big event but I had to pull myself together and get off of the train which was another event in itself. While walking in a swift mass of people my posters seemed to keep falling out of my grasp and at one moment my sac à man (hand bag)'s contents completely fell out and some stranger lady just stopped everything and helped gather all of my stuff. Once I made it inside the station I knew that I needed to call a taxi, which was impossible due to my lack of phone. Not being a stranger to awkward interactions, I asked a random man if he could call me a taxi. He then proceeded to explain to me that there was a big line outside where people waited for taxi-cabs. He then offered to help me go over to the line which I was incredibly thankful for and bien sûr (of course) took him up on. Then I stood in line and ended up getting a taxi with an extremely nice driver. I must admit that I had to pay quite dearly for this service, but it was so worth not being lost or mustering up some strength in order to lift my heavy bags. The final destination ended up being the Sheridan hotel, which my mother had previously reserved for me. Thank goodness the rest of my day was not eventful. Fortunately the next day proved to be the last time I have ever had to lift my suitcases but the bad news was my adventure was far from being over. The front desk lady at the hotel explained that I would need to give myself 2 hours in order to allow a sufficient amount of time to check in, go through security, etc. at the airport. That was not at all true. Checking in my bags was a hassle to put it in the nicest words possible. By the time I got to the ticket counter the lady asked my least favorite question "Are you traveling all alone?" I replied that I was and then she obviously felt very sorry for me and stressed that I should obtain some help. I had no idea what this entailed but apparently it involved calling a girl with a wheelchair. This kind of made me feel pathetic, but she traveled so fast with such ease, that I decided to let it go. At last I was on the plane and although I almost missed my connection in Vancouver at least all of my problems from then on could be discussed in English. Then at midnight I somehow miraculously arrived in Fairbanks. Both my parents and my dog "Toto" were there to greet me at the airport. In the car I explained that it would probably take me a while to adjust to not being lost. Fortunately I was able to get over the phenomenon of being lost amazingly fast, and even though I knew that I would miss France, I was happy to be home! 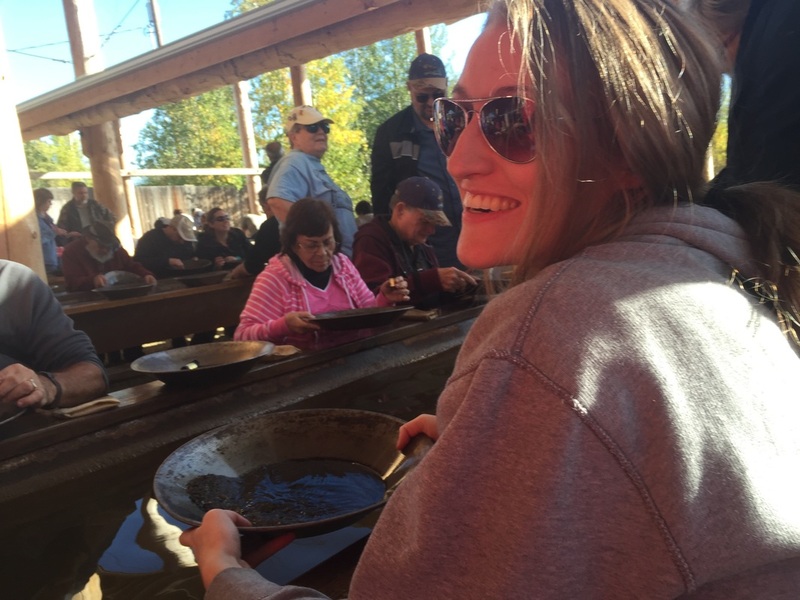 Life back in Fairbanks at Gold Dredge Number 8 feeling like a tourist as I am "trying" to Goldmine like a Pioneer. 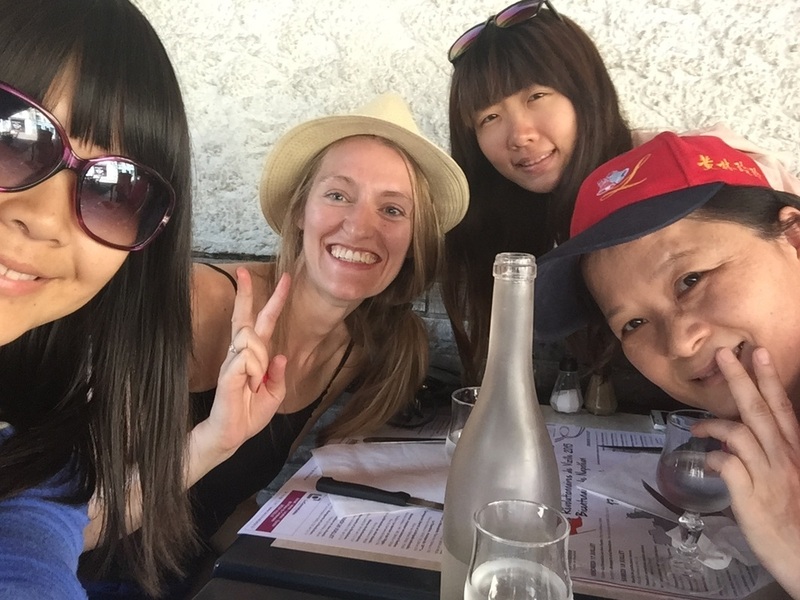 Throughout this blog I think my take home message has been that traveling is not easy, and although there are so many wonderful people in this world, getting to them can be really difficult. So my mother is a wonderful correspondent who strives to stay in touch with people. I must admit that I really admire this trait and work really hard to stay in touch with people. These days with email, facebook, and Linkenin, I must admit that it is much easier to stay in touch with people but I still find that it's still an effort. So in the Risse household there are a batch of annual Christmas cards that get sent out and the Thuery's (the family pictured here with me) happen to be on that list. Back in the day when I was very little, my parents had a Bed and Breakfast in Fairbanks Alaska called "the Blue Goose." 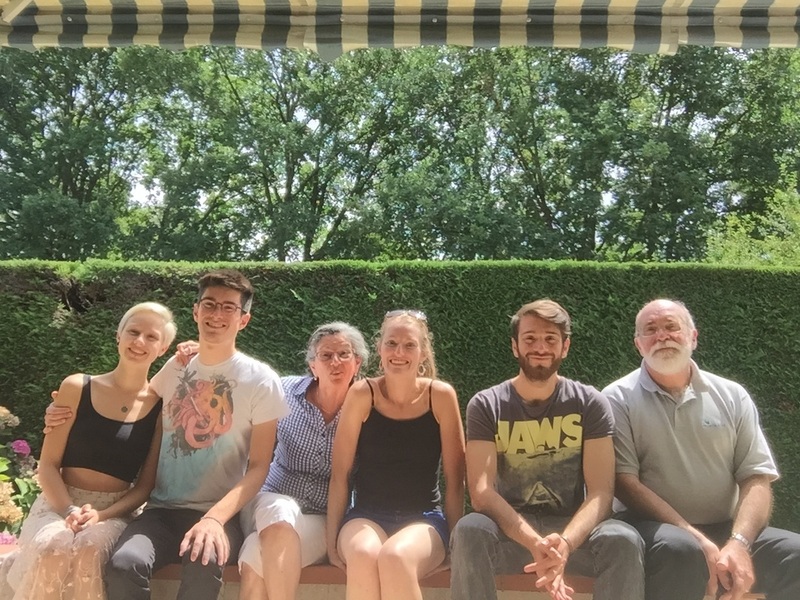 When the Thuery's were visiting Alaska they stayed with us and nearly twenty years later I was able to travel to Toulouse France and stay with them. It was so nice and relaxing to stay with the Thuery's. I was in awe that I was able to spend an entire weekend without the all-too familiar feeling of being lost. Jacques, the father, and ultimately the person who I communicated with and made all of the arrangements with was an excellent tour guide. I must admit that getting there was a hassle, but once I was welcomed into first their car and then their home, I was able to wake up renewed and had a wonderful weekend. I arrived at about midnight late Friday night so I just ate a quick bite, which I must admit was scrumptious and was complete with a cheese corse! 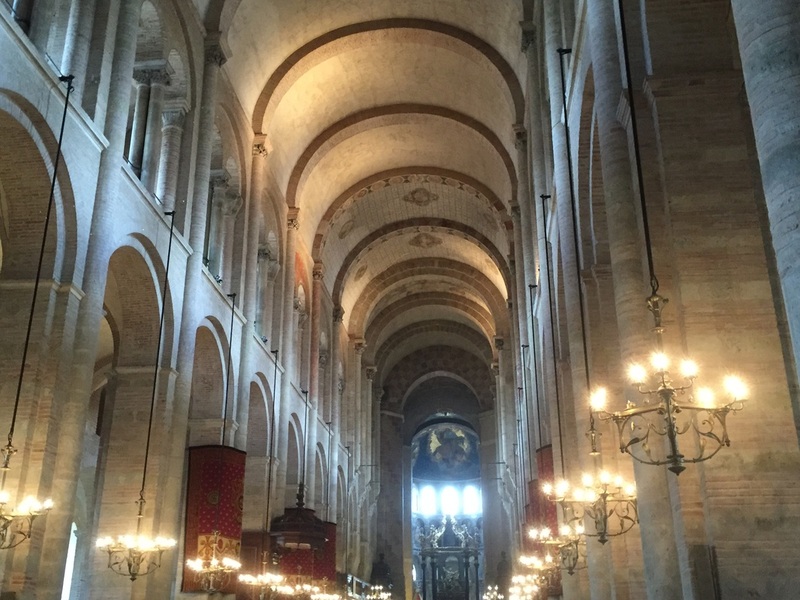 The next morning consisted of a tour of Toulouse given by Jacques. At this point I wished that I knew some more medieval history because he was such an aficionado and I knew quite frankly that I was lacking in that department, but it was still a wonderful day. 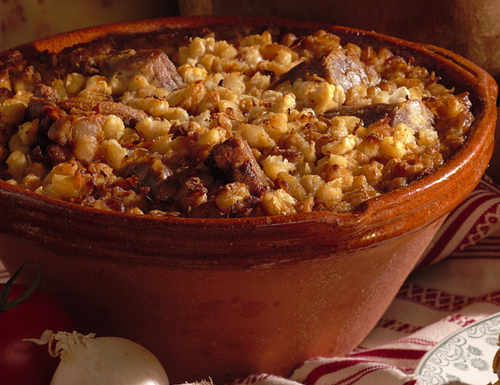 For lunch we had cassoulet, which Jacques described as more of a winter dish but it was something that he considered very regional and a "must" on the Bucket List. I am sure my summary is not doing Jacques' tour justice, however on it we saw a lot of churches and observed the location of the river. He also talked about the Occitan people who came from the region. Throughout his tour he did a good job of explaining the different types of architecture that are depicted throughout the city of Toulouse. It was amazing to me that I was able to see the examples first hand because I remember from my two days of braving art history at West Valley High School that the only way of understanding these different eras in art would be to flip the pages of the text book, but today Jacques was explaining to me that Roman architecture was characterized by its simplicity and overall rounded arches, etc. 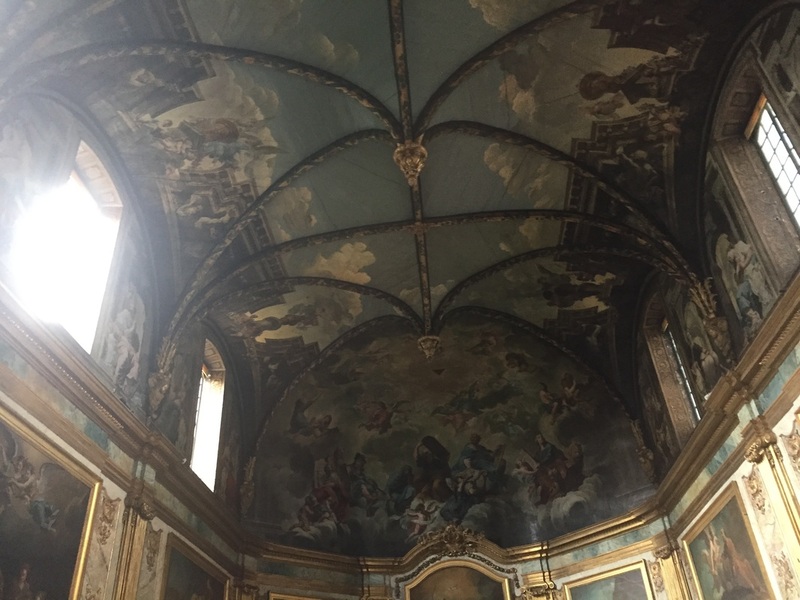 the Gothic architecture was very angular and ornate, and the Baroque is more simplistic architecturally however it was a time of great paintings/murals. After our tour we returned home and met up with the rest of the family. 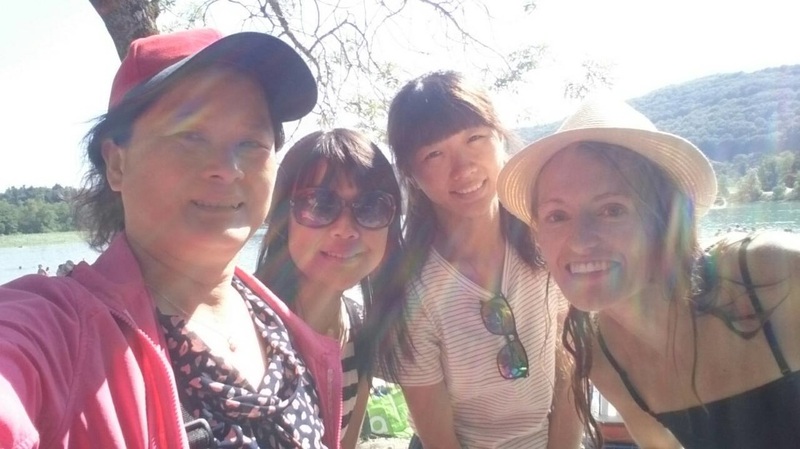 I had previously met up with Guilliame and his girlfriend at breakfast before the city tour and I had met up with Beatrice (Betty), the mom, the night before at the train station. This however was my first time reconnecting with Phillippe. The last time I had seen Phillippe was in Fairbanks Alaska where I apparently pawned off my copy of "Bambi." Still to this day I think "Bambi" is a super depressing story that I can't believe was made into a children's movie. Phillippe is now a vegan and at this point in time I bet he is more anti-Bambi than I, however even though VHS is no longer used, they still have the "Bamb!" and wanted to know if I wanted it back. I told them that they were very kind, but No! I had no idea what Carcassonne was initially but it didn't take me long to realize that I was extremely fortunate to be making this outing. Besides Paris Carcassonne is the next most important tourist destination in France. This fortress was beautiful and was kind of restored to its natural glory however Jacques conveyed to me that the researcher/historical preserver was just a little too busy and taking on too many projects therefore he took too many creative liberties and didn't always do his homework. Even though this castle wasn't completely accurate it was still magnificent. I couldn't believe that inside the castle were gift shops, ice cream shops, even a hotel. Can you imagine saying that you stayed in a castle that night. 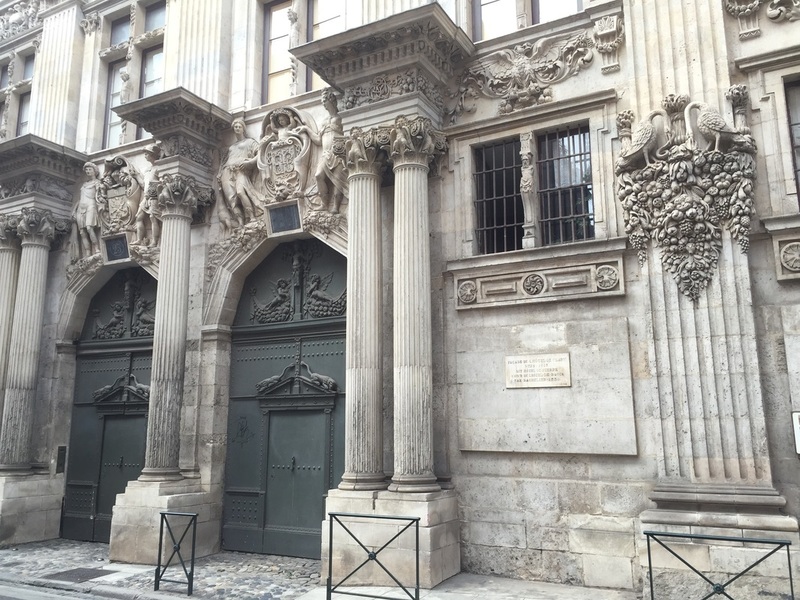 Jacques reassured me that those rooms were pas bon marché (not cheap), but still, maybe one day! 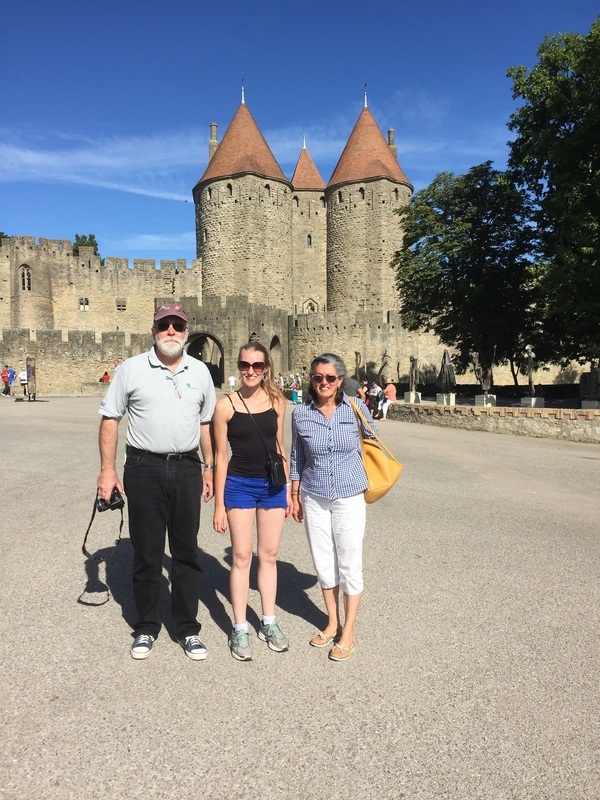 After going to Carcassonne we returned home and ate with the entire family. Then I just sat and talked with Betty while Jacques helped me gather information for a regional report on (Les Midi-Pyrénées) that I had to give in class that coming week. After about an hour of relaxing and talking with Betty I had to go to the train station. I'll never forget Jacques as I went to say Goodbye. Instead of making it a sad ordeal he said "So when will you be coming back?" Taking a moment to document my last bueno break! One of my fellow classmates said that I should be the spokesperson for the Bueno Brand. I guess my ethusiasm for this candy bar really left an impression! I must admit that it is really hard to finish something (this blog) that documents a labor of love because it feels like I am closing a book that I never want to finish. Coming back to America was probably the rudest awakening to reality that I've ever had to experience. As I explained to my tour director Anna, this trip was the highlight of my life and I'm so grateful that I was fortunate enough to be able to join this group to try and struggle to fulfill my credits at UAF. So on the final day everyone gathered for the last API dinner, and not even being a surprise at this point, I of course was in the wrong place for our meeting. Eventually after having returned to the residence hall, broken down in front of the front door attendant, I was then able to use their french phone to call up Anna and then have her meet me specifically. Anna then chuckled to herself and asked me "Michelle, qu'est-ce que tu as fait aujourd'hui?" (Michelle, what did you do today?) because it was no secret at that point that every day was an adventure for me! (Without even trying sometimes!!) I told her that after class I went to the Post Office with high hopes of sending off my books to no avail. So anyways the Post Office adventure was a real opportunity for requiring fast paced french. At first I thought maybe if I just pack a pile of books, I can ship them book rate, Right? Wrong! They wanted to charge me 160 euros to send about 15 pounds of books. Of course all of these verbal exchanges were done in French, therefore this process was mentally and physically draining (because I had to carry this weight back and forth from the Post Office to my room). Somehow the employee at the Post Office led me to believe that I could send around 7 lbs. in a box to convert to kilograms, so I thought I would try again and repack all of my stuff into three boxes to avoid paying the ridiculous prices. Well long story short. I went home and repacked everything and did a massive schlep only to find that the price remained absolutely the same. Instead of one ridiculous flat fee, now I had three boxes that added up to 160 euros. Frustrated and tired of carting around des livres très lourdes (some very heavy books) I stated to the man at the Post Office counter "Désolée, mais je ne peux pas!" (Sorry, but I can not do it!) So after the final defeat and realization that I would have to integrate my heavy books within my luggage, I decided that the best thing that I could do to feel better would be to go shopping. Kind of a bizarre train of thought when your bags are bursting at the seems but whatever! I decided to go to my favorite magasin (store) La Galerie Lafayette. This store is the French equivalent to Macy's which Fairbanks, Alaska is also lacking, therefore I considered this place to be a "Promised land of Fashion." So at the "Galerie" I ended up buying a pair of jeans to go with this chemise (shirt), chapeau (hat), des lunettes de soleil (sun glasses), et une veste (jacket) that I planned to wear in order to look very European while traveling to my homeland. Well, after traveling for like 30 hours, it's hard to say if anyone looks glamorous or European after that, but just the same, I tried, and here's a picture of my outfit. Feeling like a stow-a-way on the train but proud that I was sporting my European traveling outfit! So after buying my new pair of jeans I went over to my friend Catherine's apartment, a friendship that originated from the past B&B guests (The Thuerry's) and summarized my French vacation. Overall I found that this was one of the hardest and most rewarding experiences of my life. I guess I had never relied so much on the generosity of people who I hadn't known previously and was not related to. Not trying to sound too deep but this trip provided me with the message that humanity is wonderful. I have come to the point where I am unable to watch the news anymore because it is too depressing. I wish that instead of the news about all the terrorists somehow there could be a feature about the wonderful people who helped me. Despite there having been a slight language barrier, it's amazing for me to be able to say that I made every plane, train, and bus connection while on my European journey. I know single-handedly this would have not even been close to possible but as John Lennon said "With a little help from my [European] friends" traveling was made possible. Our final dinner. Almost everyone was smiling for this picture, but it was with a heavy heart that the end was drawing near for everyone. 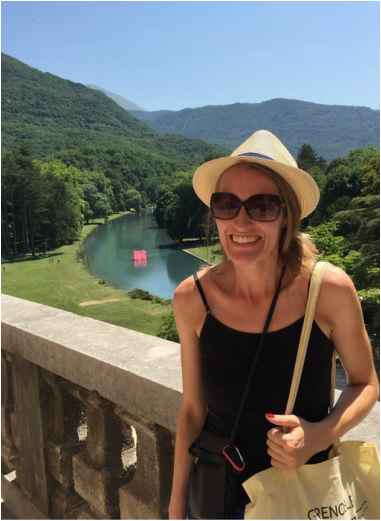 Besides giving Catherine a summarized break-down of what I happened in France and what I grew to love about life in France, I found that it was time to go. Unfortunately for me I wasn't achieving this overall sense of closure that I had anticipated. You know when you get that feeling like you have unfinished business and must return in order to bid a more acceptable farewell. I noticed that as time grew closer to avoid saying Good Bye people would just say "Hope to see you soon" or one guy at my residence hall said "See you next year." 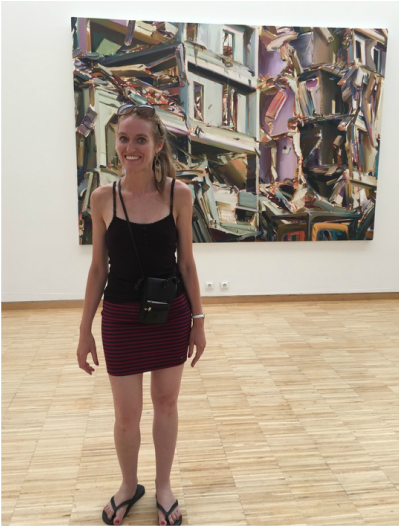 At the museum on Thursday after enjoying an hour and a half long modern art tour entirely in French. Needless to say I was completely spent and slept for 10 hours that night! It's impossible to argue that all of a sudden my life was busier, but it was definitely a valid thought. This week looking at my photo collection I realize that there's a lot more to document but in no way is it fair to say that I did more. 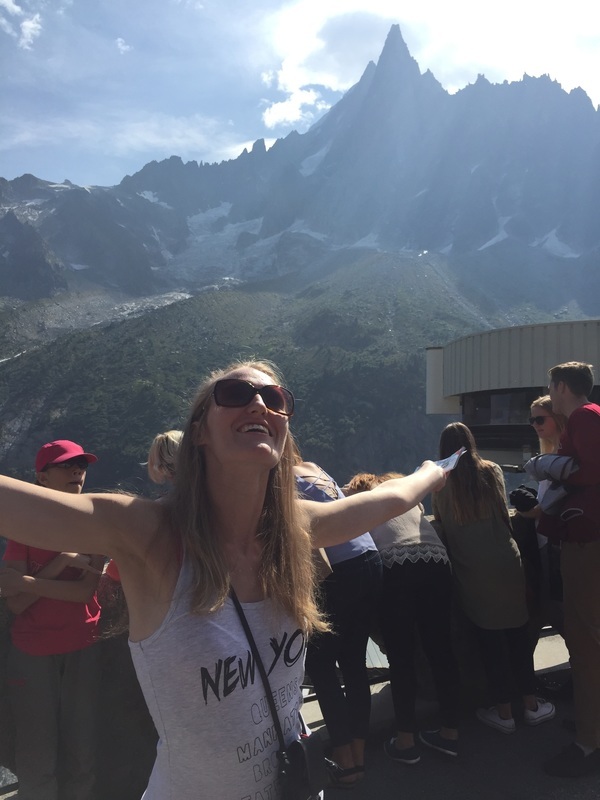 After my trip to Chamonix and discovering that the little will-power that I had could be put to use in order to ensure that the amount of stuff that I was to bring home could remain constant. I made one last very important purchase. I needed to own a watch because I have discovered that there is no discreet way to look up the time on your cell phone but a watch, on the other hand (no pun intended!) could be extremely discreet. So Monday I went shopping for the very last time. I bought myself a watch and once that purchase had been made I decided to not enter another store. I pretty much obeyed this plan, but the horrors of traveling with two suitcases will provide me with nightmares for a lifetime. And once I arrived home I told my mom that I would never travel with so much luggage and that I wanted only a carry-on bag for my birthday. I guess that little piece of information can serve as a piece to foreshadow my awful experience that was to come returning home. So Monday I honestly am unable to document anything else because I can't remember anything truly groundbreaking happening. On Tuesday I decided that I would try and bring some of this French culture that I was learning/appreciating into the cuisine (kitchen.) 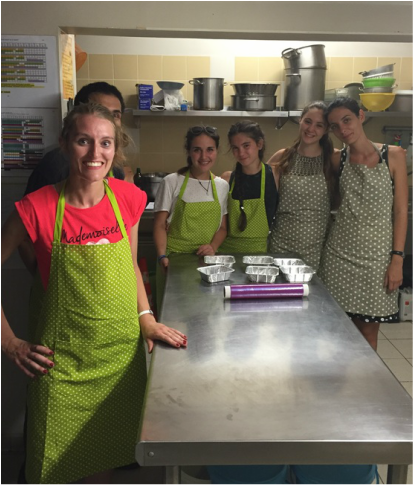 So Tuesday night marked the only night that I managed to prepare anything except for the first night in Grenoble where I boiled some pasta. Then I was like, who's kidding who? I am in France. What better opportunity to eat out? I figured that I could learn how to cook later. Even though that was kind of a negative initial mindset to have, I am so glad that I didn't cook, because I probably would have made pathetic stuff like pasta every night, therefore my cooking repertoire would remain to be depressed and because I went out and explored different restaurants and cafés I was able to discover different flavors and delicious cooking concepts that I had never experienced before. One we got to cooking class all of us students, which only consisted of 4 other girls and later on 1 boy, we started chopping vegetables in order to prepare Ratatouille. So just a little information about Ratatouille, no, it's not made with Marinera sauce, nor is it made by rodents. Honestly I was shocked to find out that Ratatouille is more of a stir-fry. I thought that it was a really complicated dish. I guess I have Disney to thank for putting false preconceived notions in my head that making Ratatouille was completely out of reach. After we cropped the vegetables, a miracle occurred. It began to rain. I was so happy that my body was finally going to have a chance to cool down. This natural phenomenon was a slight distraction from the class however the teacher managed to regain our attention. We then worked on our desert where we used la fontaine (the fountain) technique. Instead of using a mixing bowl our teacher put all the materials on our metal table and would make a hole with his finger to crack the egg into, etc. This was a very foreign concept for me, but it made me wonder if this was part of the reason why everything tasted so much better here. Unfortunately the rain didn't really do enough to really make a difference in my sleeping habits. I therefore had to employ the wet towel technique but through my laundry-mat style drying and newly purchased French perfume I was able to keep this technique as fresh as possible. The next day I went to my favorite cinema (Pathé) and I was able to see a really good film. Of course I was beginning to lose touch with American culture. I was no longer interested in the direct English translation of movie titles. This film was called "La femme au tableau," I had no idea that it was an American film but it starred Ryan Reynolds and Helen Mirren. At that point I knew that my French was really improving because I noticed that I was becoming emotional throughout the movie. Then for the next day after my courses I went to Le Musée de Grenoble (a modern art museum) to go on a guided tour to make up for the strike that was held on the first day. Well this tour was a great example of something that was severely challenging for me but was great for the improvement of my French. To my astonishment the only two people who were in attendance at this tour that was "optional" but recommended only 1 other person showed up in addition to me. I think the highlight of this tour was looking at a blank piece of poster board on a blank wall and having the guide tell us that they payed a great deal in order to purchase this piece. I told her that this reminded me of the composer who composed a piece that was silent for about 4 and a half minutes. She was like "Exactement!" (Exactly!) It was through events like this where I really stepped out of my comfort zone where I was really able to improve the most. After the tour I texted my parents and told them that I needed to do something effortless like speak in English. So then I proceeded to Skype with them for about 20 minutes and then I feel asleep for a good solid 10 hours! This was one of the awesome buildings in the cute town of Chamonix. It was absolutely adorable here! So staying in a hotel was always greatly appreciated because A.C. was always a luxury to have. Having grown accustomed to a schedule I was ready to go at 7am. Our hotel breakfast was absolutely amazing. Baguettes, bacon, croissantes, nutella, cereal; it was an absolute feast! After breakfast, which I took full advantage of, our group reconvened in order to view a natural ice cave and the Alpes. It truly was breathtaking but not completely new to this spoiled Alaskan. 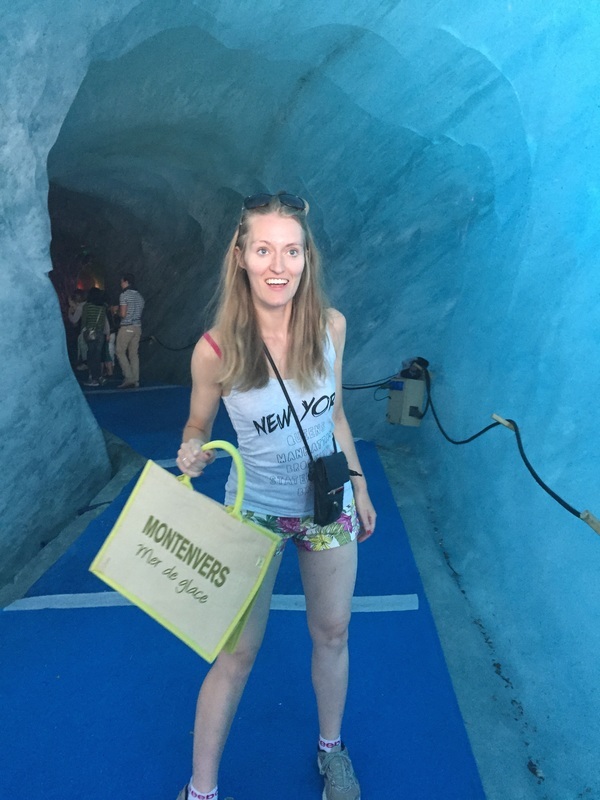 To someone who'd never seen mountains before this was absolutely amazing but I kind of felt like this wasn't quite as good as going to Denali Park but the ice cave provided me with a natural kind of air conditioning that I had been longing for this entire trip. I felt it was appropriate to do a Maria-esk "Sound of Music" type pose because the background was truly reminiscent of "the Sound of Music"
Inside the Ice Cave my API friends kept asking me if I needed a coat or something and I just replied saying "No, I am finally comfortable, but thank you for your concern!" So after our nature excursion we were free to explore the town of Chamonix the rest of the day until our bus was to leave at 3:30. When we first came into town I expressed that I wanted to eat at a stereotypical french café and Byron (a fellow API participant) decided to join me. We had a very nice lunch that was extremely mellow, then we caught up with a few other APIers and went to a candy store. It was truly the most gorgeous candy store that I have ever seen. 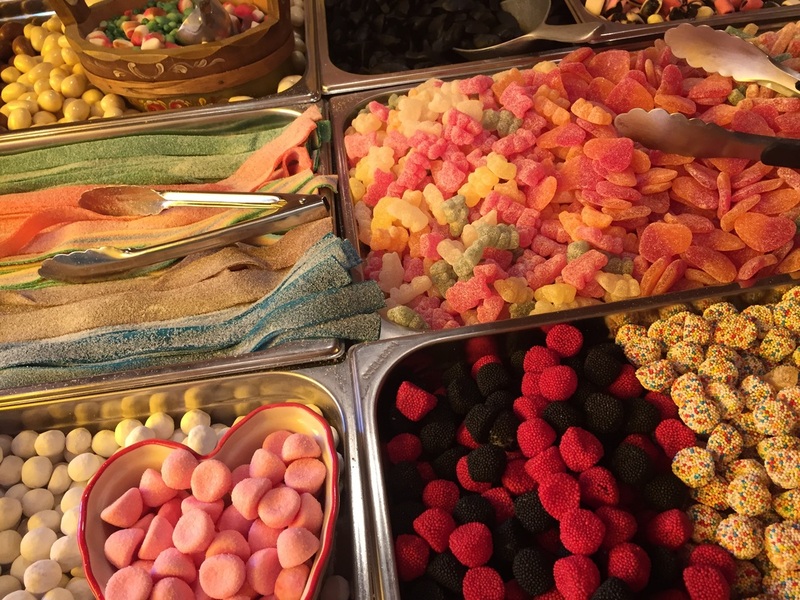 As I checked out I told the propriétaire how impressed I was, she then complemented me on my speaking (which makes any situation better), and then led me to believe that this was normal for candy stores to be like this in France. Only part of the beautiful candy display which was all delicious and fresh! So as time went by my desire to spend money was dwindling however the flame was still slightly burning and I found that it was still possible for me to shop like a champion. I then told Josh (another API classmate) not to let me buy anything else. He actually stuck by this challenge. At 3:30 we all boarded the bus and once we arrived home it was time to fais le devoirs (do homework)! 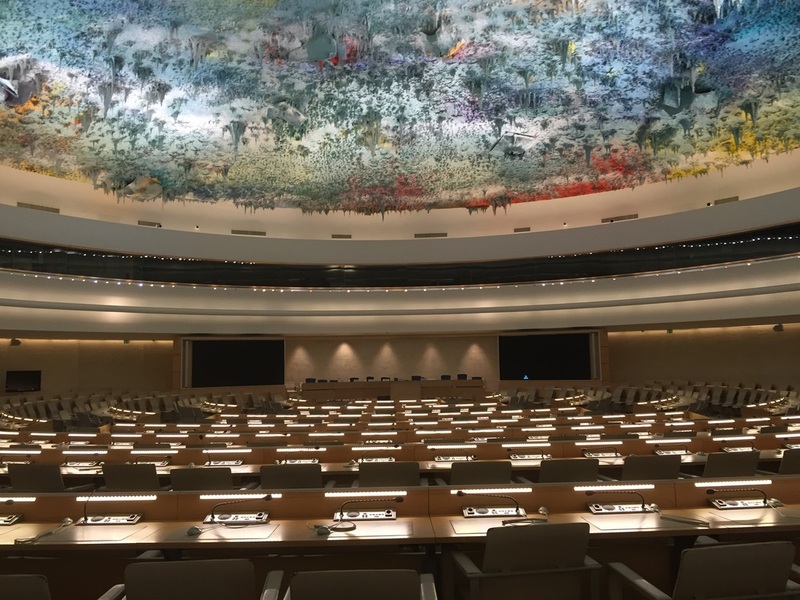 At the United Nations in Geneva, Switzerland. Well today I had to wake up fairly early which was not a problem on account of me being super excited to go to Switzerland. 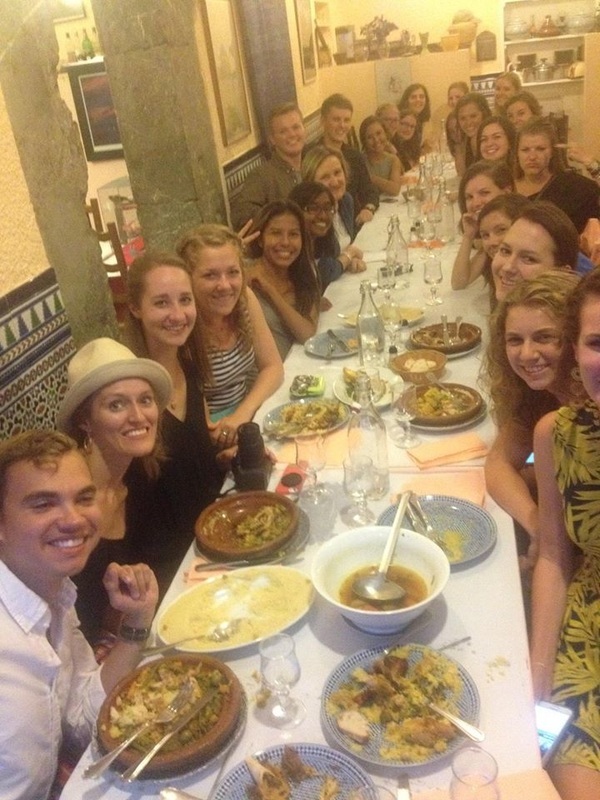 All of us students met at the same tram stop, and by 8:30 we were off in our amazing tour bus. We stopped at this gas station in order to go to the bathroom and stock up on food for our upcoming expensive journée en ville (day in the city). I was even amazed by the gas station food here. 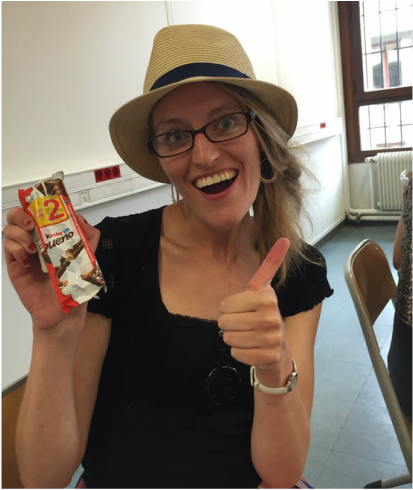 I was able to get a sandwich for lunch, a breakfast sandwich, a drink, and some chocolate bon-bons for about 5 euros. Unbelievable! And this food was all fresh, it wasn't all like disgusting gas station food found in the US. 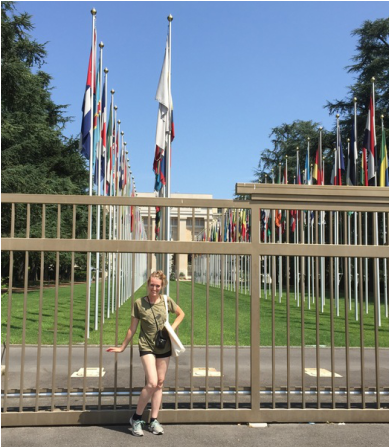 So about an hour after our gas station stop we had made it into Geneva and had to show our passports before officially being able to enter the United Nations. So when we first arrived we had a few minutes so of course I went into the gift shop, I guess the spot of my favorite pastime! Then we went on a tour. Looking at this ceiling definitely was the most impressive part of the tour for me. 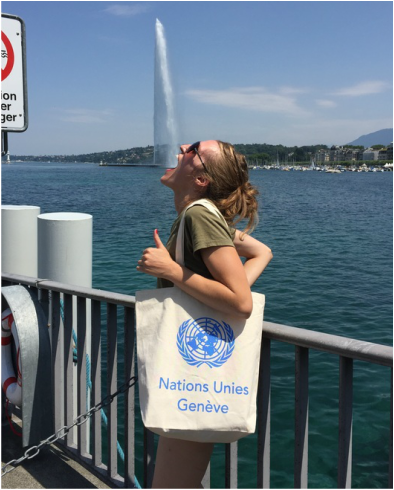 After we had this tour we were then able to spend some time in the city of Geneva. Let me just say, everything was trop chère! (too expensive!) When I was forewarned about Switzerland being expensive I just sort of shrugged it off thinking like it was probably like $2 different from what I was used to paying. No. To put things into perspective, me and my friends wanted to sit down at this outdoor park area that was next to a food stand. Not wanting to be rude we decided to buy something from the vender. Just an order of fries cost about 6 swiss franks, probably around the equivalent of $10. Yikes! Needless to say the weather was again sweltering and since things were so expensive 2 hours was really sufficient in getting a feel for Swiss culture. Taking a much needed water break. I WISH! I have to give Sarah credit in the conception of this picture idea! So after going to the Lake in order to take some "silly" pictures I then went downtown. The only shopping that I was able to afford doing was at H&M on the clearance rack. At one point in that day I just wanted to use the bathroom and sit down and write some postcards. In that case the most dependable answer to that predicament was to go to ye old faithful "Starbucks." I knew that here for sure they would have a bathroom, free WiFi, and tables to sit down at. Sure enough I was right, but in order to use the bathroom I had to buy something in order to obtain the code in order to access the bathroom. Being there felt fairly touristy but I did order the cheapest and most European thing I possibly could. I ordered a Nutella cookie which was about 3 swiss franks. Hey at least it tasted really good and gave me the code. After Starbucks I walked a little more around the town and then decided to go back to our meeting place. While waiting I noticed that a lot of people were coming back discouraged about the ridiculous prices. Well eventually it was meeting time and once everyone arrived back on the bus everyone crashed. 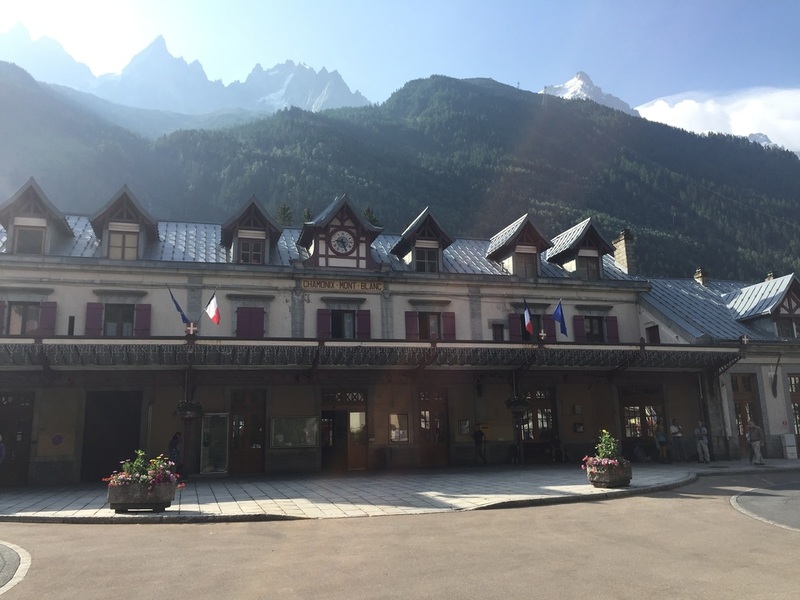 Next on the agenda was about an hour and a half drive to a quaint ski resort town called Chamonix. Before heading off anywhere Anna would give us ideas of what to do and would always put out there what their cuisine specialty was. In this case it was fondue (super exciting.) As a child I remember having fondue parties to celebrate birthdays and now this time it would be authentic. So when I first got into Chamonix I dropped off all of my stuff and discovered that my roommate was Hayley. First I went to the museum. Museum trips are always sort of challenging for me because I have developed this vocabulary exercise that I feel obligated to do. So the game is comme ça (like this), I try to read as many exhibit boards as possible and then write down all of the vocabulary words that I don't identify or should start using on a regular basis. This is a truly exhausting exercise and after being there for about an hour and a half, I knew that I was spent. So I wanted to go back to my room and collapse but a part of me knew that I needed to go out and try the fondue. 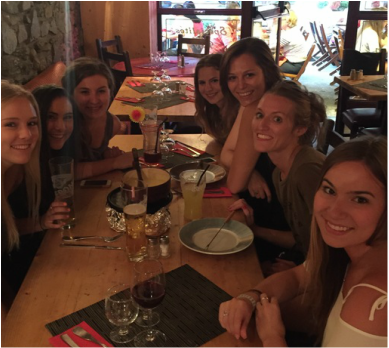 So fortunately there was a group of girls from my API group that I was able to go with and eat fondue with. Me and the group of other API girls before our expensive/enjoying dinner was experienced. Needless to say I now was able to say that I tried French fondue another check off the bucket list but while others were talking about going out and experiencing night life I knew that the best I could do was go directly to bed. So I actually managed to do a little better than that. I was able to take a shower and watch "WipeOut" dubbed in French. No pun intended, but I was completely WipedOut! So after the excitement of a really full weekend and a successful holiday it is really hard to recall the events of the next few days. At this point I know I started to curtail my frequent shopping trips. On Thursday I decided that I needed to buy a suitcase in order to bring my newly acquired possessions home. The suitcase purchase was probably one of the most memorable experiences of this whole trip because it was the first time that I was able to realize that my hard work was really paying off and that I was close to being fluent. So I went into this store and this older woman was extremely nice and attentive. She was probably shocked by how fast I made the decision to buy a huge Samsonite suitcase. The truth is that this decision wasn't made quickly. Truth be told I had been window shopping ever since I arrived. This was the first time that I had gone inside this store but in my head I knew exactly what I wanted. Long story short, this was a wonderful experience. I was able to not only describe that I had given into the sales and therefore needed a large suitcase to go back home to Alaska in, I was also able to express that I wasn't interested in the warranty, and then I was able to set the combination. Before I left the lady complimented me on my French, and this really marked the first genuine complement that I had received about my French while in France, so that even made this a better experience! Of course in addition to my shopping I must admit that my cinéma visits were also still a very important part of my day. This week I managed to see "Les Minions" and "Visa Versa" (Inside Out). No offense but throughout this trip I learned that American culture dominates when it comes to films and music, therefore a lot of the films I watched were dubbed. It's amazing how one day of school makes a week seem so much shorter but it really does. Finally Friday came and in order to feel productive I decided to do laundry before my big journey. I was also turning into a compulsive cleaner on account of the severe heat in my room. This heat required me to sleep every night on top of a wet towel, with a wet towel on top of my upper body, and the last towel on my legs. I discovered that my fan was broken (that Marie lent me) on the 100 degree day. When the doorman looked at it and the final verdict she told me "Il est cassé" (It is broken). That piece of news almost made me start crying. Therefore the towel method was my only answer and I found that it actually worked, I was slightly grossed out by it, so every morning my room looked like a laundry-mat because I had pillowcases and sheets hanging from anything that had an edge, but miraculously I was able to sleep every night! "Liberté, Fraternité, Égalité" -the famed words of the French Revolution. Well this American was living in the best of both worlds. Two independence day holidays in one month! 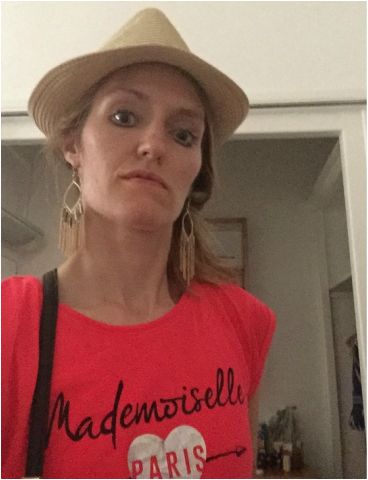 Granted one wasn't really acknowledged by anyone other than my small group of American friends but today "Bastille Day" was really a big deal. So I signed up for this excursion the week prior, just because I knew that the CUEF had a tried and true tour that was well worth its cost and to avoid any coordinating on my part. I was ready to rely on someone else after having to think on my toes and arrange my entire weekend journey in London. So for the excursion we went to first Le château de Vizille, Lac de Laffrey, and then we finished out the day looking at this Napoleon monument. In order to get to these places we had to take this tour bus which was "très luxe (very luxurious). It was a little awkward because I knew people well enough to just wave but not well enough to sit next to, therefore when I first got on I just took a window seat. The bus eventually filled up and this nice Taiwanese girl Helen sat next to me. She was so nice and completely welcomed me into her and her friends' group. For the rest of the day I hung out with them, that why in a lot of pictures I'm flashing the "peace" sign, because Asian culture absolutely loves that! This was at lunch, not my favorite meal but in great company. As I say to my students "Ok, is everyone peaceful?" At that point we definitely were. So when we first got to le château Vizille the museum part was definitely closed, so we had to go to lunch. 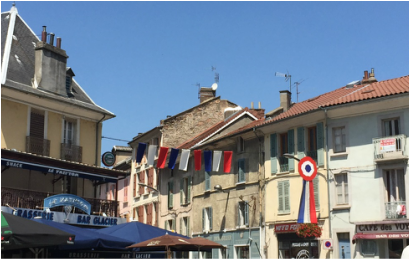 I'm afraid that this town has become so touristy that there is not a lot of authentic French restaurants in that location, so needless to say, that meal was pretty Americanized, but oh well. Then we went onto the château (castle) which was beautiful and dedicated to showcasing the events that led up to the French revolution. 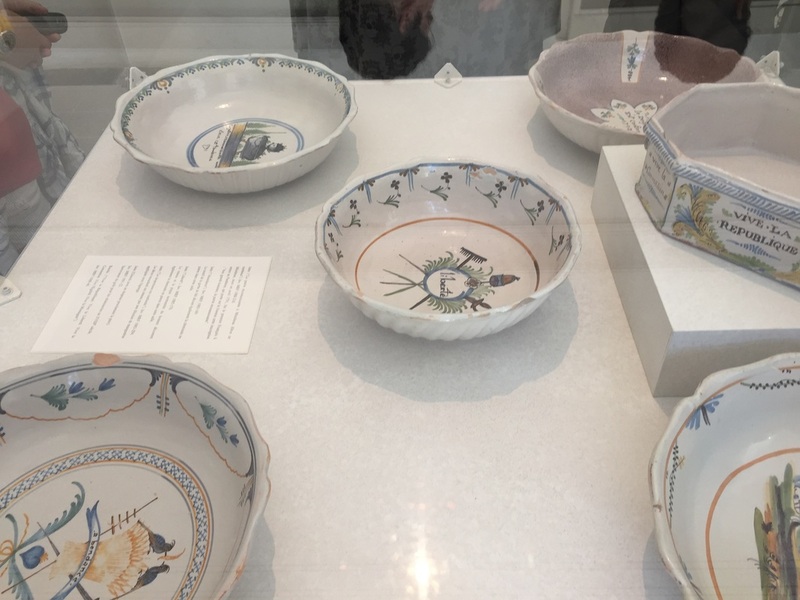 Here are some of the beautiful artifacts that we saw. Whenever I see beautiful china I always think of my mom and know how much she'd appreciate it. 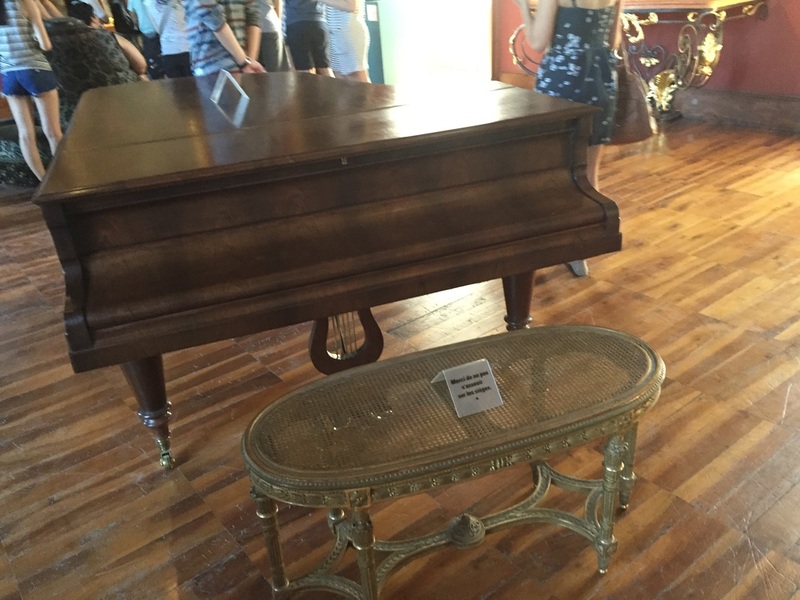 For Michael Risse: A picture of an ornate piano along with an ornate bench, and probably hadn't been played in centuries. Is this for real? Yes it was! Standing in front of this gorgeous viewpoint from the balcony of the castle. So after the castle, we drove for about an hour longer and got to Lake Laffrey. Annecy had kind of put the fear of sun stroke into me but I decided to apply my SPF 50 sunscreen and hope for the best. I ended up getting a little more burned that day but the severity of by burn from Annecy I don't think can ever be topped! Taking a picture after a successful day of swimming/exploring. The last element of our excursion was going to the statue of Napoleon which I'm sure that I've seen in a text book or two, but it was really neat to see in person. So once I made it back to the residence halls I went in the lobby and got online. Then some people from my API group told me that they were going out to the fireworks tonight. I told them that I would love to go with them. All I can say is, What a celebration and culmination to a great day. The fireworks display in the park that we saw was probably the most impressive display that I had ever seen. I was talking amongst my friends and one of the guys that came from Houston, TX explained that he lived next to a "Six Flags" but doesn't ever think he's seen such an impressive display of fireworks. The park was absolutely insanely crowded, I was very fortunate to be with my API friends who had befriended some French military men who showed us around and kept us together. At one point I lost my group and the military men assured me that they would help me find everyone and they stayed true to their word. Then after the fireworks was a big dance celebration where they would play 1 french song to every 5 american songs. So the last thing that they played before I had to bolt to make sure that we entered the residence halls before they locked the doors was "Uptown Funk." I was dancing so confidently to this song that I acquired a little fan club and when it was time for me to go people were like "No---." What a great ending to the night! The only downfall of living this incredible life was that I couldn't remember the typical events that were taking place. 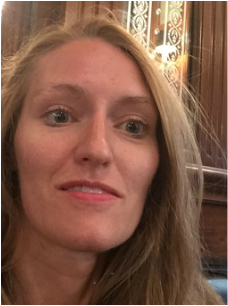 In addition to this blog, which I must admit wasn't updated in a timely manner, I needed to document my day with a diary, so I guess I will keep that in mind for future adventures I plan on taking. Anyway, since I am unable to recall exactly what happened on thiss day. I am going to describe what a typical day was like in Grenoble, France. So I would normally wake up around 7:00am because I had to get ready for my class which began at 8:30am. Since I was such an avid shopper, I decided that I would always strive to wear fun outfits. I have sort of gotten into this grove as a substitute teacher, I've found that if a teacher wears clothes that students can comment on then as a result the ice is broken a lot earlier and this enables you to be a lot more friendly and memorable. 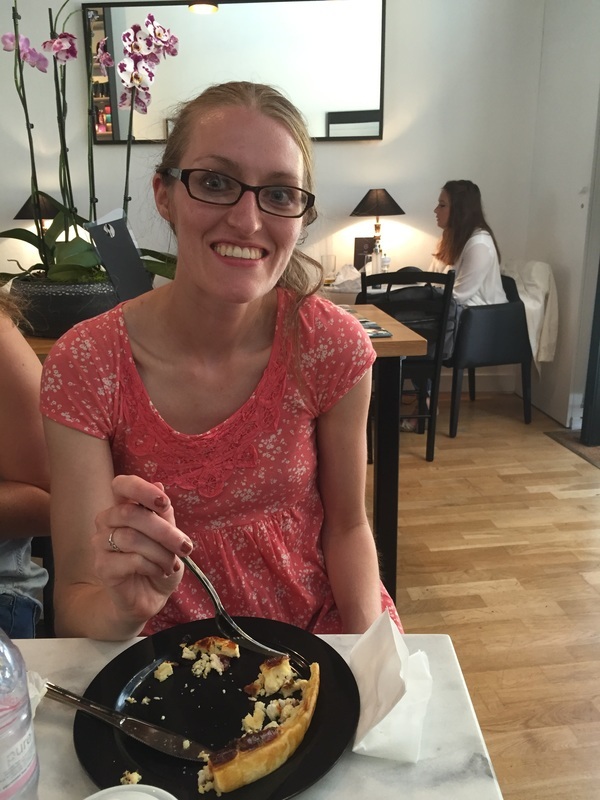 In Grenoble enjoying a quiche on one of the first days, feeling super overheated but still managing to sport a smile and a somewhat cute outfit. So after class I would usually check in with my API directors. I was proud that I finally knew how to find this building. After getting lost numerous times and then actually having Marie walk me through a fool-proof route complete with straight forward directions and pictures that she had me take on my phone, that is what enabled me to successfully find the office. After spending a few hours there answering my emails, taking care of any travel business, and punching holes in my papers in a ferocious attempt to stay organized (Just a side note, did you know that in France they only have 4 hole punches and folders are completely different, also it's very difficult to buy lined paper, instead everyone writes on graphing paper.) While I was taking care of business in the office I was also able to drastically improve my French. I was able to speak to all of the directors and this is probably where I was able to practice the most. After going to the office I would go à centre ville (to the downtown). In the beginning of my trip I was really obsessed with their really impressive sales, but after a while the fascination started wearing off, especially when I realized that I was going to have to bring everything home. So besides spending all of my extra-cirricular time en faisant les courses (going shopping) I also had a 5 time movie pass. I absolutely loved going to this cinéma called The Pathé. The seats here were like big velvet lounge chairs and the room was air conditioned. I started going there on such a regular basis, that employees there started recognizing and saying hi to me. Around 8pm (20h00) is when the French would eat dinner. And yes I know this was an extremely unhealthy practice but I would just snack up until this point and have 1 impressive meal par jour (each day.) I would always eat at a different place to really help augment my knowledge of French culture/French food. This was not the easiest thing to do. There was this delicious fast food, (and we were in France, so fast food wasn't disgusting, it just meant that it was prepared really fast in front of you), that I could have just gone to, but in the long run I wouldn't have traded going out and ordering in French. Then for the last part of the day I would go down to the lobby where I had an internet connection. I would usually have some homework to do and I also I would check my email and facebook to see what life on the outside world was like. I also really enjoyed talking with the various doormen. I even went so far (because most of them had French as their first language) to have them check my homework for any glaring mistakes. I can still remember it being like 1am and Rémi being like "I'm sorry, this is technically correct but not how we would say it in France." Well 2 perfectionists working together equates to one really late night but this is how I was able to get so much better. Probably the favorite shirt that I was able to buy at the teeny bopper store :"Jennyfer." At a Pub in London where I ate fish and chips while waiting for my show called "The Commitments." This is where I met a very wise man named "Martin." Waking up in my luxurious hotel room made me feel as if I was still dreaming. The AC enabled me to finally sleep really well. 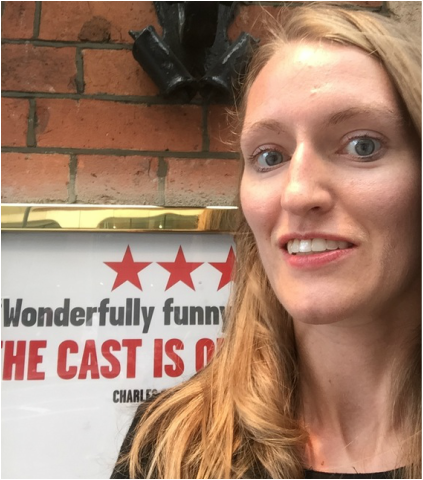 I felt like staying in my room until 11:50 to justify the expense, so I checked out at noon and headed over to the Palace Theatre where I bought a ticket for "The Commitments." 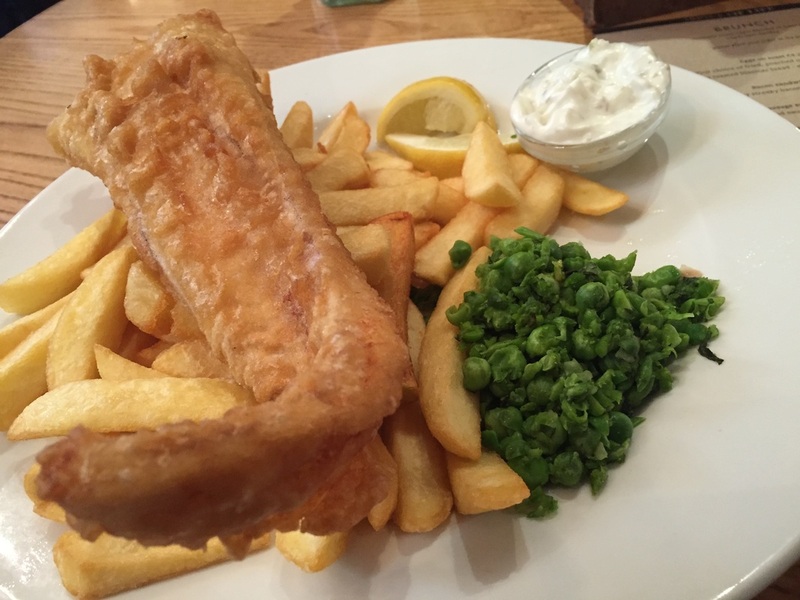 Then I had about a hour and a half before my show would begin so I decided to go to a pub and order the famous English staple "Fish and Chips." Of course they were delicious and while I was sitting there reflecting, I started half watching the Tennis match. I had no idea it was "Wimbledon," the biggest game of the year. I must have looked like a pretty serious spectator because my "acting" led a man who was named "Martin" to believe that my sole purpose of being in that pub was to watch the tennis match. He ultimately came next to me in order to get a better view of the screen, then he asked me who I was rooting for? When I told him that I was merely just intrigued by the game and was not really rooting for anyone he then began to start asking me more questions. I told him that I was in London for a mere "day trip" and that I was trying to see as many shows as possible. I told him also that I had to eat the most stereotypical English meal "fish and chips," and figured that there was no better place to do it in than a pub. A touristy picture of my fish and chips meal. There aren't too many of these "point and shoot" food pictures in this blog, for fear of looking like a complete tourist! Martin, who was super nice, then said one of the nicest things that anyone has ever said to me. "You are a great representative of America." He then told me that all of the American tourists were nice, so I couldn't help feeling some national pride by knowing that we were doing something right across the ocean. I then told him the reason that I was here was to experience a hectic show marathon. I said "I know it probably sounds crazy but I really wanted to see Miss Saigon and was somewhat close in France." He then answered me by saying "This is not crazy at all, theatre is what you love, it's what's important to you." He told me that he also did not live in London but loved coming into the city to watch the tennis matches. This is what he loved to do. So after my nice chat with Martin I went off to my show "The Commitments" (a story of a group of Irish friends who decide to form a band and make Motown music) -the show was really a blast, but after it was over I had to face reality that I had to get back to France in order to go to school tomorrow. I am not a fan of the selfie but here I had no choice! In front of the Palace theatre where "the Commitments" was playing. So my first stop was "the Tube" station. Unfortunately my card didn't work and in order to avoid wasting a lot more time, I decided to take a cab to Victoria station, which ultimately would take me to Gatwick airport. The cab ride was so nice and walking out in the rain waiting for the cab was absolutely heavenly. Coming from the unbearable climate of Grenoble, I totally welcomed the fact that I was getting wet. So while other Londoners huddled underneath their umbrellas, I marveled in the fact that I was getting wet. When I told Anna about this rain and being thankful that I was finally cooling off. She asked me if I did a rain dance? Out of all seriousness, I didn't, but if I knew one I would have seriously considered doing it because I was that thankful! So the cab ride was extremely worth it and the cabbie dropped me off directly at Victoria Station where I was able to ask for help and struggle sufficiently in order to figure out what train to take in order to get to the airport. Of course once the train ride was over I found that EasyJet was the main airline of that airport but unfortunately for me my terminal was way on the other side of the airport. So after about an hour of struggle, which fortunately this time was all done in English I found myself at the right gate. Not long after I made it onto my airplane where I promptly feel asleep for my 1 hour flight. After the flight was over I had another crucial step to take in this stressful journey. I had to get onto the shuttle-bus that went to the Grenoble Train station and then I finally had to take the tram home. Well fortunately for me there seems to be an infinite supply of nice French people who are always willing to help me with my navigation predicaments. To be extra sure, I asked this young French man if I was waiting for the right bus. He told me that I was and was completely happy to discover that I was American and somebody who he could practice his English with. Therefore he took it upon himself to befriend me and help me navigate to be residence hall. Fortunately everything worked like clockwork. We were able to take the last shuttle bus and "Bastien"- my new french friend) informed me if the trams were to stop running by the time I was back in Grenoble then he would personally walk me back to my dorm. I bet his mother, his traveling partner, wasn't an extreme fan of this idea, but fortunately the last tram came by and I was able to get on it. An hour later I was in my bed and was extremely thankful that my voyage had been successful and that I had ultimately followed my heart to the theatre! A lifelong Alaskan who is completing her UAF practicum hours in the Naknek school district.